« Roads and lily pads: there’s a link? A glimpse of saltmarsh prairie. Imagine the hamlet of Houston is somewhere just over the horizon. Do you ever wonder what the land where you live looked like before you arrived? Playing around with the historical photos in Google Earth* can give you an idea what one might have seen, at least from the air, as far back as about 1940. But what about 150 or more years ago, before the tangle of highways and sea of rooftops? 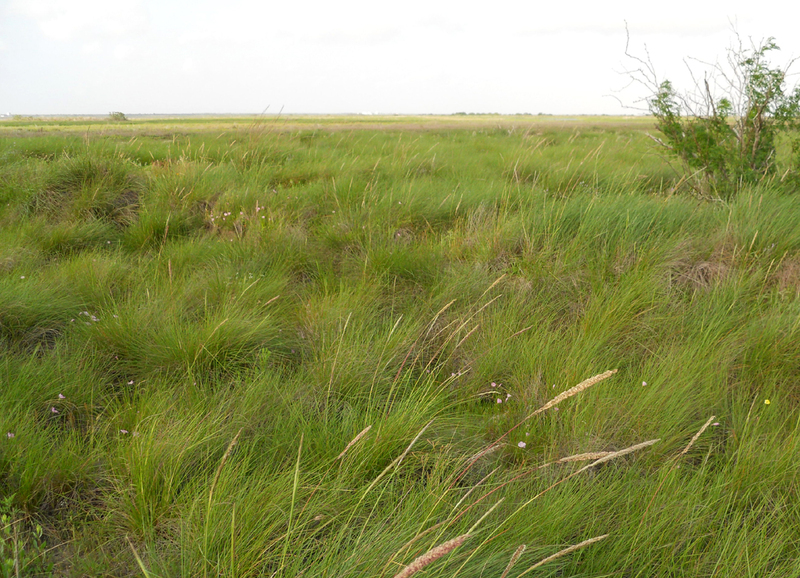 If you live along the Texas Gulf Coast, can you picture the millions of acres of tall grass prairie? Coastal prairie, steeped with marshland and traced with shady bayous, was the predominate landscape in our area from the Pleistocene Era to a few decades ago. Fortunately we have the descriptive writings of a few early explorers and travelers to recreate the scene. Frederick Law Olmsted is better known as the patron saint of landscape architecture and the designer of New York City’s Central Park, but in the late 1850’s as a journalist he and his brother made a trip by horseback across Texas to Mexico and back. Olmsted was assigned to report on the culture of slavery in the South, but foreshadowing his future career, he also turned his keen observation to the landscapes he encountered. His dispatches to what is now the New York Times were later published as A Journey Through Texas, Or a Saddle Trip on the Southwestern Frontier. On the way to Port Lavaca’s rival, the now-vanished Indianola, the pack mule Mr. Brown “subsides” in a marshy mire, with only his ears visible. The approach to Houston took Olmsted across the Katy prairie. Olmsted’s impression of Houston in 1857 is more agreeable than the ornithologist John James Audubon’s some 20 years earlier. He also finds it an odd, violent town, but not without beauty. The travelers were determined to continue directly from Houston to New Orleans. They found that local knowledge of the route was so scanty that just beyond city limits “the eastern shore is completely terra incognito”. “No other road is known than the one by which cattle are driven to New Orleans, and this one so imperfectly, that we added probably fifty stray miles to our distance, by following indistinct paths and erroneous information.” At that time, the great value of coastal prairies and wetlands for flood control, wildlife habitat, and water quality was inconceivable. The prairies east of Houston were sparsely settled and traditional farming of was difficult on the marshy land, so it was concluded that the land was poor. Olmsted did make it to New Orleans by horseback, and continued to on to New York and into the annals of history. Next, we will turn the clock back a few more centuries to Alvar Nunez Cabeza de Vaca’s incredible tale of survivorship, in Time Travel on the Prairie, Part 2. * Type your address into Google Earth, and after you enjoy the sight of your home as seen from the sky, click the historical imagery button which appears on the toolbar as a clock. A timeline appears under the toolbar, and pulling the slider along it will take you back in time through a series of aerial photos. Thanks for the hint on finding the historical Google Earth maps. I’ve heard they exist but not how to access them. I use Google Earth maps to research almost everything I write. I’m amazed by the variety of historical scars left visible from space. Nice to meet another virtual voyager. Charly, I’m glad you picked up something useful. Google Earth images, especially the historical ones, always recalibrate my perception of the places I think I know. I hope I’ll “ground truth” the places I’ve virtually voyaged someday–like Wisconsin!